We had those the other day and they were massive! They are huge! Good man, saving the table! OH wow, that huge hailstones! 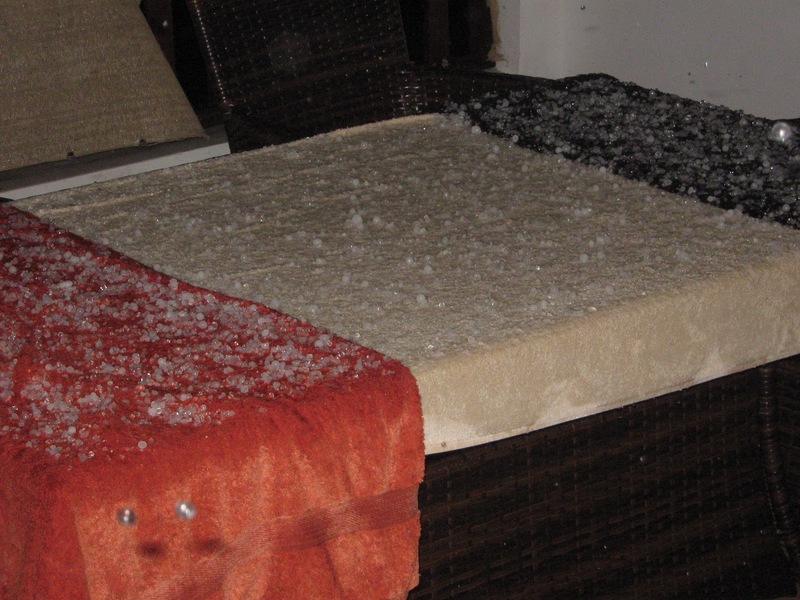 :O that is a heavy hailstorm! Good lord! Hail is the only weather condition that scares The Boy, because of the noise. Blimey! They look like big diamonds - if only ey?! My goodness, that must've been on helluva hailstorm! Blimey, you had bad weather there. Just lots of wind here. Great pic. Project 52 sounds far more manageable - good luck with it! ooh that would have been a great start to the new year! wow I thought it was broken glass! Don't know how I managed to stay silent for so long - it's really not in my nature! I was worried it was going to be! That's what I thought, especially as I've been doing Silent Sunday for ages anyway! It was the first storm that woke up Leo although he said the thunder not scaring me Daddy - but you just need to cuddle me! I like that idea... Project 52! Can you believe there is so much rain in Cyprus? !